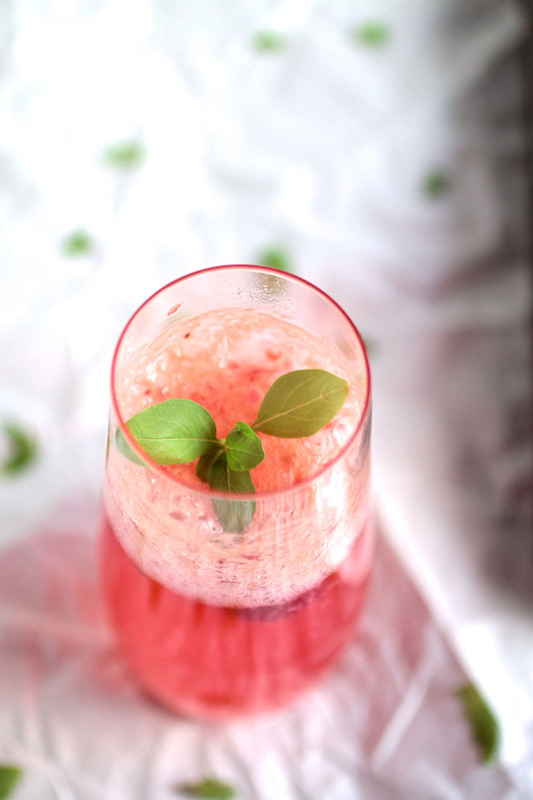 Raspberry basil bourbon spritzers are perfect for entertaining. 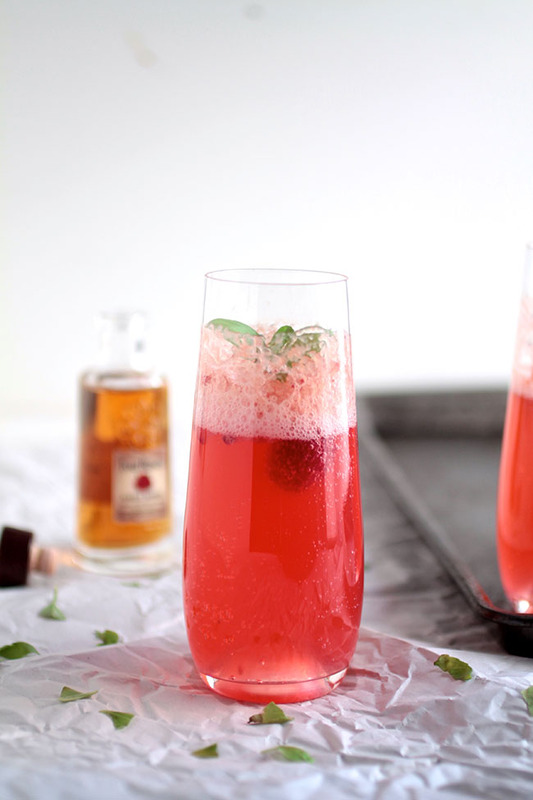 Homemade raspberry syrup, bourbon, and a spritz of champagne make this cocktail a hit. I wasn’t really a big bourbon drinker before I started dating Kyle. I drank it in the “it’s college and we’re out of beer so it’s this or nothing” kind of way, but a bourbon connoisseur? That I was not. (Side note: it definitely just took me five tries to spell connoisseur right. Don’t tell Cornell). College was more the time of Keystone (barf) and cheap vodka. The time of $3 Old Style Pitchers and springing for Coors Light on “special” occasions. College was also the time of long hours and no sleep and wayyyyyy too many extracurriculars and a 200-page Honors Thesis and the best friends ever and WHOA I think I just slipped into some serious Knoxstalgia. Shall we get back to the booze, please? I’ve started to really like whiskey and bourbon in the last few years. It helps that Kyle is a whiskey/bourbon person, so he always has new and interesting spirits and I steal tastes here and there. I’ve never been a big fan of overly sweet drinks, and I like using bourbon in cocktails to give them a little more depth and a little more edge. If you’re not a big bourbon person, this is a good cocktail to start with: it’s fairly mellow and a lot smoother than some other similarly-priced varieties. 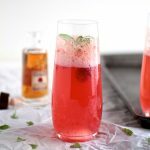 You can also play with the amount of simple syrup and champagne in this cocktail recipe to mellow out the bourbon if you like. I Valentine’s-ed it up (also, um, it’s winter and that’s depressing so we need some color in our cocktails) by using the reddest of raspberries, but played up the depth of the bourbon with a bit of fresh basil. The flavors are pretty mild – a bit of sweetness from the berries, a bit of earthiness from the basil, a bright note of lime and (of course) the fullness and depth of some très tasty bourbon. Top the whole thing off with champagne and you have a delightfully fizzy cocktail that packs a serious punch. 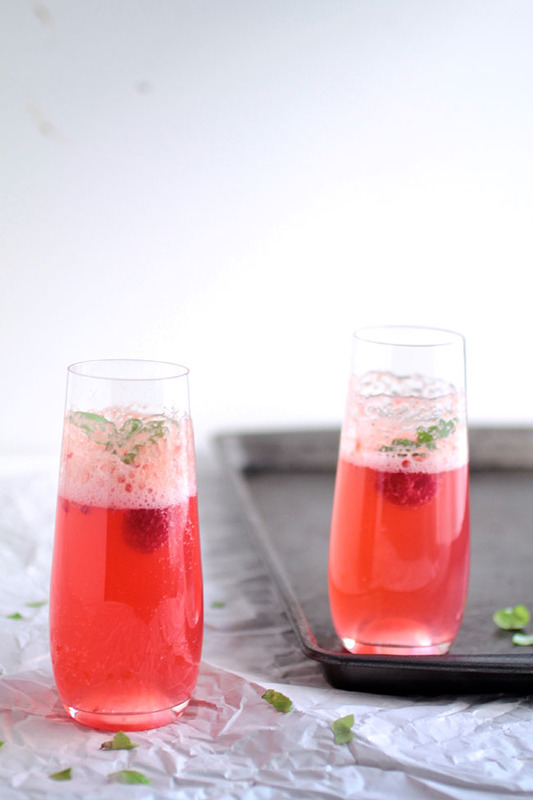 These raspberry basil bourbon spritzers are the perfect colorful cocktail for entertaining. Stir all ingredients together in a small saucepan and bring to a simmer over medium heat. Cook, stirring occasionally, until sugar has dissolved and berries have softened. When syrup has cooled, strain syrup through a fine mesh sieve into a jar or other container. Save berries for smoothies later in the week and set syrup aside for cocktails! 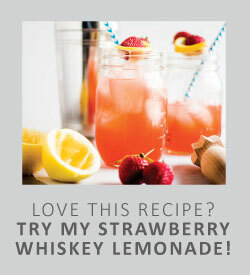 Combine raspberry syrup, bourbon, lime juice, and a few handfuls of ice in a cocktail shaker or glass measuring cup and shake/stir to combine and chill the liquid. Strain out the ice (using either a mesh strainer or the built-in strainer on a cocktail shaker) and divide the bourbon mixture evenly between two champagne glasses. Top each glass off with about 1/4 cup of champagne. Pour the champagne slowly so the drink doesn’t bubble over. 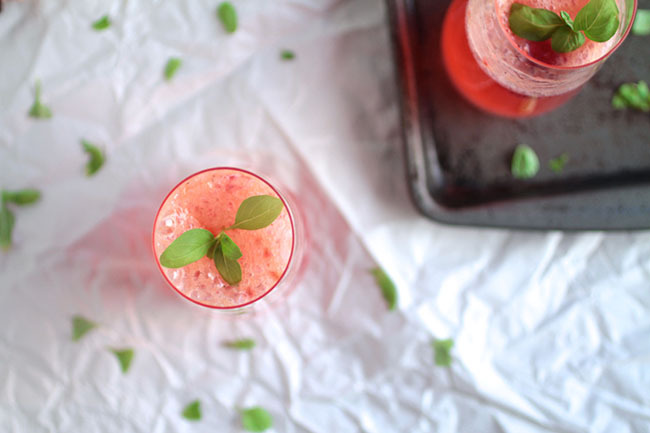 Top each drink with a sprig of fresh basil and a fresh raspberry and serve immediately. This drink isn’t particularly sweet, but feel free to adjust the amount of syrup in your cocktails to play with the sweetness until it’s perfect for your taste buds! Use a little extra syrup for a sweeter drink or cut back on the syrup (and increase the lime juice) for a more tart cocktail. Use tonic water or club soda in place of the champagne if you like.